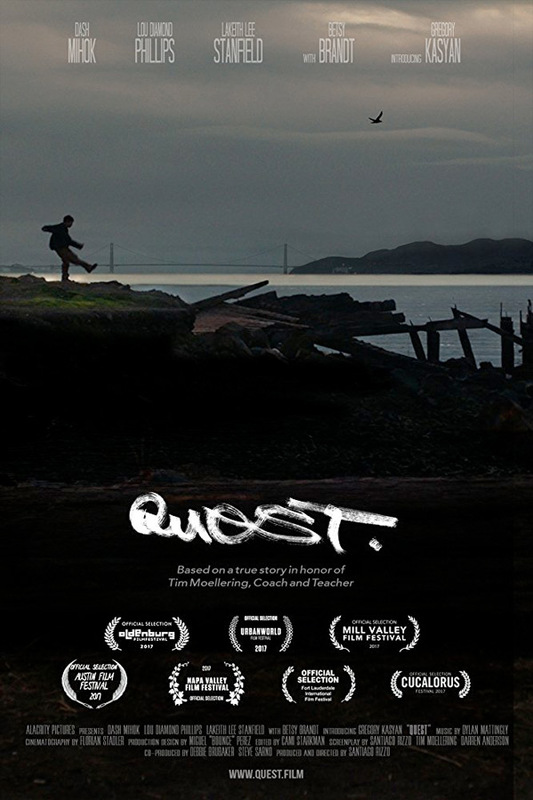 Quest, a movie about Twelve-year-old graffiti artist Mills avoids his abusive stepfather (a brutal performance by Lou Diamond Phillips) by staying out all night tagging. His mother works nights and is oblivious, unconvinced her new husband is cruel to her son. The late nights on the streets aren’t just dangerous, but they’re also not conducive to studying and doing homework. Mills’ grades are failing, and his emotional state has led to outbursts. His teacher has had enough and is ready to give up on him. Enter burly, awkward, but extremely loveable football coach and teacher Tim. Refusing to walk away from any student, he offers to help Mills, giving him a spot on the football team in an effort to keep him out of trouble. The two bond as Tim goes out of his way—sometimes blurring the student/teacher boundary—to steer Mills in the right direction. Unfortunately, their innocent relationship is suspect to those around them. Will Tim risk it all to save Mills? Based on a true story, QUEST is an absolutely moving story of one teacher’s unwavering dedication to a student in desperate need of love. —E.F.